Mail was not delivered in Edmonton and affiliated municipalities Monday after hundreds of local postal workers walked off the job as part of a series of rotating strikes across the country. Mail will not be delivered in Edmonton and affiliated municipalities Monday after hundreds of local postal workers walked off the job as part of a series of rotating strikes across the country. The Canadian Union of Postal Workers said the 24-hour strikes began Monday at 12:01 a.m. local time in Edmonton, Victoria, B.C., Windsor, Ont., and at 1:01 a.m. in Halifax. 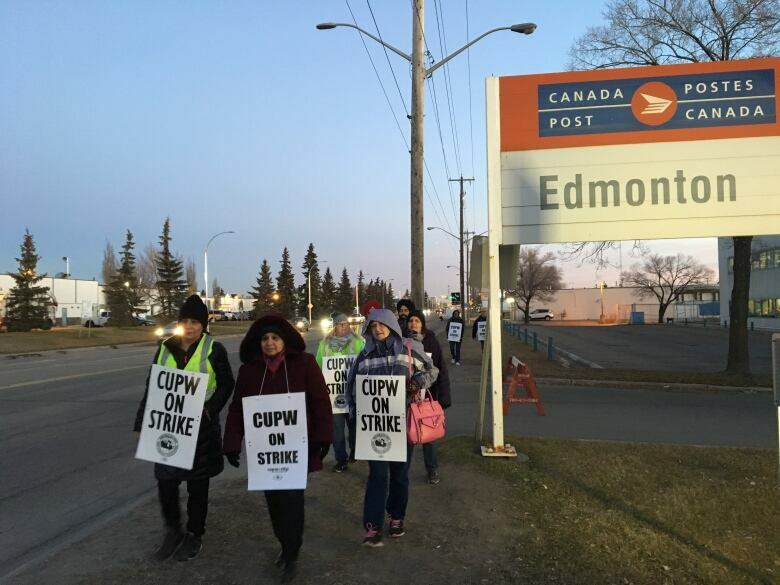 On Monday afternoon CUPW confirmed the strike also led to the closure of post offices outside of Edmonton because employees there are members of the Edmonton union local. 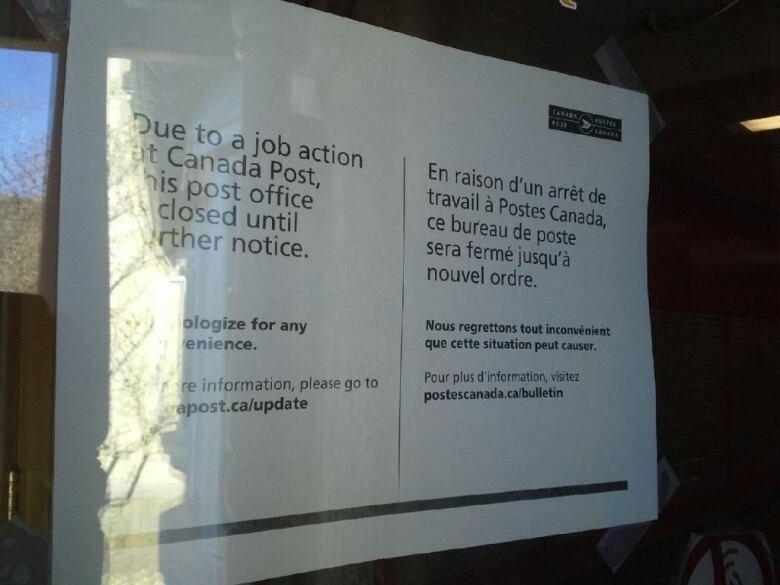 The post offices in Edson, Hinton and Jasper were closed as workers walked picket lines outside. "It's no mail on Monday. There will be no processing or delivery until Tuesday," said Nancy Dodsworth, president of the Edmonton local of the Canadian Union of Postal Workers. "It's going to put pressure on Canada Post." In Edmonton, about 40 workers walked the picket line early Monday at the Canada Post processing facility at 12135 149th St.
Picket lines were also set up at Canada Post depots in Rosedale, Whitemud South, Mayfield Common and Delton as well as the downtown letter plant, Dodsworth said. Pickets will remain until 12:01 a.m. Tuesday with shifts slated to begin work at that time heading back on the job, she said. The union opted for rotating strikes in order to minimize service disruptions, she said. "We'll have mail processing happening elsewhere in Canada that will still be shipped here, but that will have to wait until we're back open for business and working," she said. "Service will slow down but it will not stop." "Canada Post had the opportunity this weekend to stop any postal disruption on Monday, but instead, as they have for almost a year, they refused to talk about the issues that matter to our members," Mike Palecek, CUPW national president, said in a statement. "Our goal has always been a negotiated settlement but we will not agree to anything that doesn't address health and safety, gender equality and good, full-time middle-class jobs." 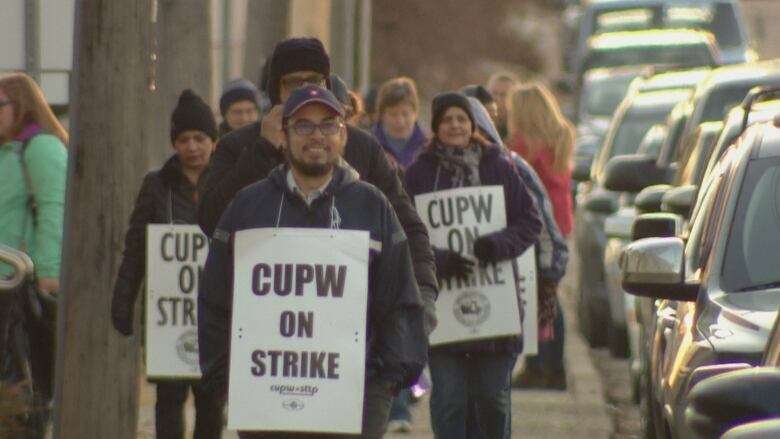 CUPW has been negotiating collective agreements with Canada Post for almost a year. Dodsworth said the key issues of job security, forced overtime, better health and safety measures and gender equality pushed workers to walk off the job. "We have a lot of issues on the table that are health- and safety-driven that Canada Post just has not dealt with," she said. The demands on delivery continue to increase and more workers are getting injured on the job. "We have forced overtime, the volumes are increasing exponentially, we are doing the same work that were doing but with double, triple the amount of parcels," Dodsworth said. Safety is a concern for Greg Mady, vice-president with the union local in Edmonton. In 2014, Mady was hit by a vehicle while delivering mail and suffered a concussion, cuts and two broken legs. "That was despite me bringing it up to supervisors three times that the area that I was working in was dangerous," Mady said Tuesday on the picket line. He is now confined to a desk job because of ongoing pain in his legs. Dodsworth did not speculate on how long the strike action might last but said members are committed to getting back to the bargaining table. "We will keep rotating these strikes as long as it takes." The union represents 50,000 employees across Canada and about 2,000 members in Edmonton.